A marketing page is a webpage that is hosted by Dynamics 365 and usually includes a form where people can register for an offer, update their contact information, manage mailing list subscriptions, and more. All the information submitted through a marketing page is automatically captured by Dynamics 365 and applied immediately to your customer database. 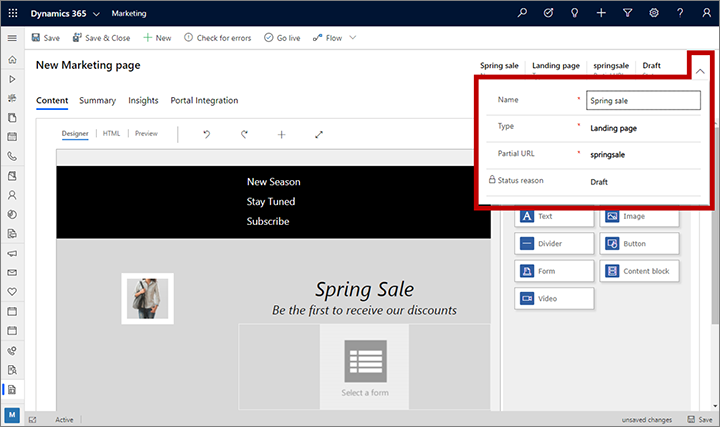 Marketing pages integrate with—and provide expanded functionality for—many other Dynamics 365 features, including email marketing, customer journeys, behavior analysis, lead scoring, and result analytics. The marketing-page feature described in this topic requires that you have a Dynamics 365 portal associated with your Dynamics 365 for Marketing instance. If your admin chose to install Marketing without a portal, then the features described in this topic won't be available to you. If you attempt to go live with a marketing page without having a portal available, you'll be alerted to the issue and offered a chance to install a portal if you like (admin privileges required). For details about how to create landing pages without using a portal (or in addition to the portal), see Integrate with landing pages on external websites. Note, however, that a simple default subscription center is available even if you don't have a portal. 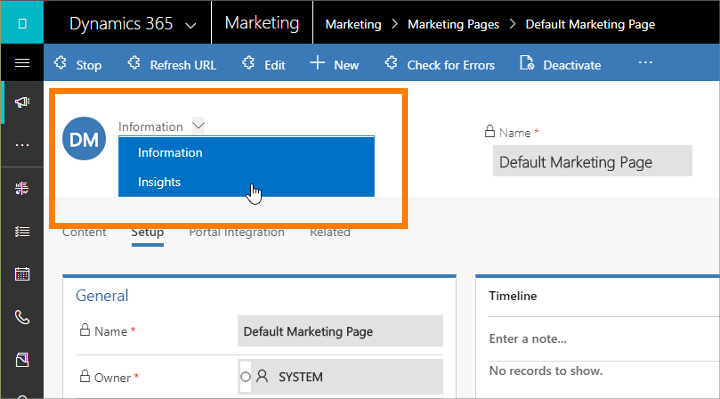 This page is hosted by your Dynamics 365 for Marketing server and can be customized using the features described in this topic. More information: The default subscription center. Go to Marketing > Internet Marketing > Marketing Pages, and select New in the command bar to start creating a new page. Choose a page template, which creates your initial design by establishing the page type, column layout, and sample content. Add and edit your page content. Use the graphical editor to drag new page elements to your design (including forms, text, images, and more), and use the HTML editor to add extra features, custom styles, and scripts. Along the way, you might need to create new forms, but usually you'll be able to use existing ones. When you are satisfied with the design, check it for required content and technical errors by selecting Check for Errors in the command bar. If a problem is found, read the description, address the issue, and try again until the page passes the error check. Select Save in the command bar. Your page is now verified and saved in your system, but is still not available on the web. Select Go Live to publish it by using the portal capabilities for Dynamics 365, where it will be made available at a public URL. You are now ready to start promoting it by including links to it in your marketing email messages, banners, social-media posts, and other marketing initiatives. The remainder of this topic provides more information about these steps, including how to work with forms and form fields, how to integrate marketing pages into emails and customer journeys, and how to read and interpret results. Landing pages provide a webpage with an input form that visitors can use to sign up for a download, discount, mailing list, or other perk by entering their contact details. When a visitor submits a form, Dynamics 365 automatically stores the submitted values in your database, creating new records or updating existing ones as needed. All marketing email messages must include a link to a subscription center, where mail recipients can go to unsubscribe, choose other lists to subscribe to, or update their contact information. You can choose which mailing lists to include in each subscription center, but all subscription centers will also include a check box the visitor can use to opt out of all marketing emails. If you'd like to enable recipients of your marketing email messages to forward those messages to friends who might also be interested in your offers, create a forward-to-a-friend marketing page and include links to it in your marketing email messages. Dynamics 365 for Marketing tracks when messages are forwarded by contacts who use the forward-to-a-friend form, but not when contacts simply forward a message by using their standard email client. Messages forwarded using an email client will still contain the web beacon and personalized links of the original recipient, so your email results will show all interactions with these forwarded messages as being done by the original recipient too—but when a contact uses the forward-to-a-friend form, Dynamics 365 for Marketing generates a new web beacon and personalized redirect links for each forwarded message. Forward-to-a-friend recipients also won't see any personalized information that was intended for the original recipient. For reasons of data privacy, all data entered into a forward-to-a-friend form is deleted after 30 days, so no new contact or lead records are created unless a recipient of the forward chooses to register with your organization using a landing page. Go to Marketing > Internet Marketing > Marketing Pages to go to the full list of all pages currently available on your instance, and then select +New in the command bar. You'll first be asked to choose a template, which establishes the page type and column layout and might also provide sample content. Then you'll be in the content designer, where you can start designing your page. While working in a marketing email message or customer journey, add a marketing page tile or design element to your journey or message, and then select +New on the Properties tab instead of choosing an existing page. A quick-create flyout slides in from the side of the screen, where you must enter values for all required fields and then select OK. A new marketing page is created with your selected settings and is applied to your new customer-journey tile. However, you'll still need to finish the page later by choosing a template and customizing it as needed. You can do that now by selecting Edit on the Properties tab while the page is selected, or you can do it later either from here, or from the full list at Marketing > Internet Marketing > Marketing Pages. Every time you create a new marketing page, you must fill out the fields provided in the header of the page. Type: Choose the type of page you are making. Each type has different requirements and options. Select Save on the command bar after you've finished making these settings. The Content > Designer tab provides a graphical tool that you use to design your content by using drag-and-drop, point-and-click operations. Add new elements to your design by dragging elements from the Content > Designer > Toolbox tab to the content canvas. Choose a design element that already exists in your design, and then use the Content > Designer > Properties tab to configure and style it. When you select a design element on the canvas, you'll usually see a pop-up toolbar just above the element. The tools it offers vary depending on which type of design element you've selected. The toolbar typically provides commands to move, copy, or delete the selected element. For text elements, the toolbar offers commands for applying basic text formatting as you would in Microsoft Word. To style the overall page with basic fonts, colors, and background, open the Content > Designer > Styles tab. Use the Designer > HTML tab to edit the raw HTML directly. You might use this to paste in an existing HTML design, or to fine-tune the code in ways the graphical editor doesn't support (such as custom attributes or logic). Dynamics 365 comes with a collection of sample templates to help get you started quickly. You can also save your own templates, which you might do to establish your own visual identity and quickly create new pages that conform to it. You can view, edit, and create all marketing page templates by going to Marketing > Lead Management > Marketing Page Templates. The process for creating a new template is similar to creating a new page, but you'll start from a blank slate rather than choose a template at the beginning. While you are building a marketing page it remains in draft status, and is therefore editable in Dynamics 365 but is unavailable to customers on the internet. When your page is ready for use, you must publish it by selecting Go Live. Your design will be checked for errors and then, provided it passes, be published to your portal. If a problem is found, read the error message, address the issue, and try again. You can edit a live page by selecting Edit in the command bar. While you are editing it, it remains available on the internet. After editing, select Save to go live with your changes. Your design will be checked for errors and then, provided it passes, your updates will be published. Most marketing pages include an embedded form, which you must design and publish separately from the page. The imported form is validated together with the page when you publish it, so if an embedded form has been removed or changed so it is no longer valid, then you'll see a validation error when publishing or saving an edited page. You can remove a live page from the internet by selecting Stop in the command bar. Go to Marketing > Internet Marketing > Marketing Pages and use the search, sort, and filtering controls to find the page you want to inspect. Use the drop-down list above the marketing-page name to switch to the Insights entity form. Explore the various tabs and displays here to view submissions and gain insights.